Horse racing is all about the thrill. It’s about the speed, the rush, the adrenaline, the challenge, the sound of hooves pounding the track, the sight of extreme physical exertion, the pushing of boundaries human and horse alike. And more than anything else, it’s about the money. Above all else, horse racing is a business and a multi-billion dollar one at that. It’s not for the love of the sport and certainly not for the love of the horse, it’s for the love of money. This video post is the third in my series on horse ethics. In the first, we looked at horse riding in general and the musculoskeletal damage it causes and in the second took a close look at the effects of the bit in particular. Now, not everyone can agree on the ethical nature of horse riding itself, including many vegans. But horse racing takes the commodification of horses to a whole other level that should even give the most staunch non-vegan pause. With money as the priority, horses are treated as no more than cash machines. This so-called sport is rife with cruelty on so many levels and I’ll do my best to touch on as many of them as possible. Please see the list of resources at the bottom of this post for further studies and articles. The cruelty of horse racing begins long before the track. 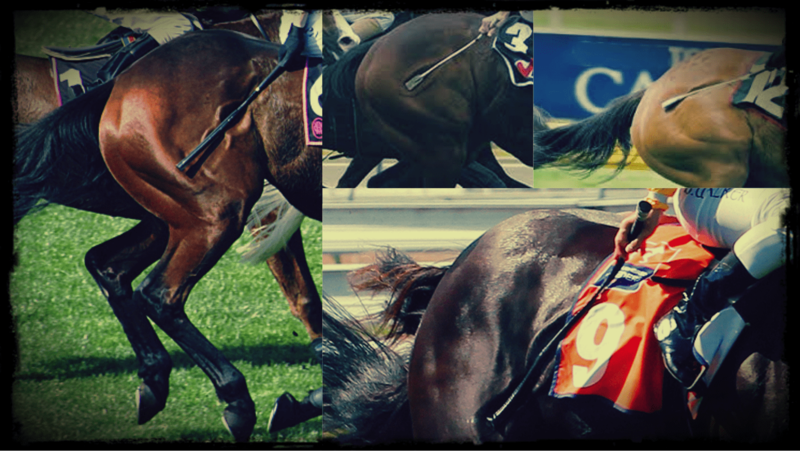 Racehorses are genetically manipulated and bred to run as fast as possible. Their lives begin at a stud farm where mother horses are kept pregnant 90 percent of their shortened lives through the use of drugs like Prostaglandins and the alteration of their environment in order to manipulate their natural cycles. Once born, potential racehorses are ripped from their mothers, who are immediately impregnated again until they can no longer produce foals and are sent to slaughter. Having been separated from their mothers, these newborn foals need sustenance and are nurse by “nurse mares”–horses with lower pedigrees who are impregnated simply to produce milk for the racehorse foals. The children of the nurse mares are of no use to the industry and as it’s illegal to send foals under six months to slaughter, many are killed by a brutal clubbing or are simply left to starve to death. They are then skinned to produce high-end leather products, termed cordovan leather, and their meat often sold for human consumption. A 2009 report from the Jockey Club stated that approximately 49,817 mares were bred that year, meaning approximately 49,817 by-product nurse foals were needlessly slaughtered. And that’s only in the United States. This horrific cycle of forced pregnancies, stolen children and premature death closely mirrors the dairy industry, wherein mother cows have their calves taken at birth and slaughtered for veal so that humans may consume their milk. Being bred as a potential racehorse does not save the other foals from a similar fate. Out of the hundreds of thousands of potential racehorses bred in multiple countries every year, only 5-40% will go on to race. The remainder are either sent to slaughter for human consumption or pet food, re-entered into the breeding industry, or sold for lower-tier racing, which has even less regulations and safeguards. While the consumption of horse meat has long been taboo in many societies with even regular consumers of other animal products balking at the idea of eating horses, what many people don’t realize is that horse slaughter is simply the back-end of horse racing. Just as the egg industry has no use for male chicks and grinds them up alive or gasses them, so too are the horses not deemed fit enough for racing discarded as industry waste. For those horses who make the cut to race, it’s just the beginning of a tortured existence. Race horses typically begin rigorous training when they are around 1.5 years old, long before their bodies are fully developed and their skeletons mature. According to the text Practical Anatomy and Propaedeutic of the horse, the length of time for complete growth of the epiphyseal plates, or cartilage, is not until they are (on average) between 6 and 9 years old. The extreme training demands put on these vulnerable young horses leads to a tragic preponderance of fractures and breakdowns, leaving them finished by the age of 4-6. These injuries, more often than not, seal a horse’s fate as they are deemed to expensive and troublesome to treat. On average, 24 horses die per week on racetracks across the United States, with numbers in Australia as high as 68 per day or 25,000 a year. The injuries aren’t all external breaks the demands of racing cause a large proportion of horses to bleed into their lungs and windpipe, called exercise-induced pulmonary hemorrhage, with a University of Melbourne Study finding that 50 percent of race horses had blood in their windpipe and 90 percent have blood deeper in the lungs. 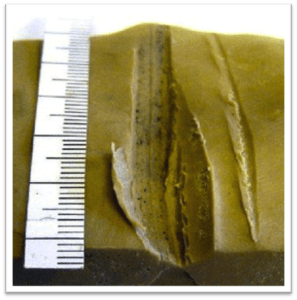 Their high concentrate diets of grains also leads to gastric ulcers with a study in the veterinarian finding them present in 89 percent of horses with many of them developing deep, bleeding ulcers just within 8 weeks of the commencement of their training. When not tossed aside as too expensive to treat, injured horses are pushed to keep racing with the aid of dangerous drugs. Pain medication can mask injury, allowing wounded horse to run harder, further endangering their lives- as many as 90 percent of horses that break down have pre-existing injuries. Journalist Max Watman explains that because “thoroughbreds are bred for flashy speed and to look good in the sales ring … the animal itself has become more fragile” and that “to keep the horses going,” they’re all given Lasix (which controls bleeding in the lungs), Phenylbutazone (an anti-inflammatory), and corticosteroids (for pain and inflammation). Injured horses aren’t the only ones drugged, however. Former public relations manager for Churchill Downs, Alex Straus, says, “there are trainers pumping horses full of illegal drugs every day. With so much money on the line, people will do anything to make their horses run faster.” This includes chemicals that are made to bulk up pigs and cattle before slaughter, cobra venom, Viagra, blood doping agents, thyroid medications, stimulants, and cancer drugs, among others. In addition to being chemically pushed to perform, horses are brutally whipped during races in what is probably the most public and socially endorsed form of animal abuse today. The racing industry assures that whips must be padded and when used properly only stimulate a horse, not cause pain. However, according to a study by professor and veterinarian Dr. Paul McGreevy, the padding failed to protect horses in 64 percent of strikes and 83 percent of whip impacts showed visible indentation of the skin, with some 75 percent of strikes hitting the horse’s flank in contravention to the International Agreement on Breeding, Racing, and Wagering. He also found that 70 percent of strikes were delivered “backhand” and were thus not counted under the rules limiting the number of strikes. In many countries, the number of strikes is only limited until the final 100 meters, wherein horses may be whipped ceaselessly. A piece of ballistic plastic consistent with a horse’s flesh shows the damage from a standard single whip strike. This piece of ballistic plastic consistent with a horse’s flesh, shows the impact of a standard single whip strike. Dr. McGreevy himself took this further and did a thermograhpic study of his own leg after delivering a standard blow to his thigh. Thermographic image showing the blow from a single whip strike. 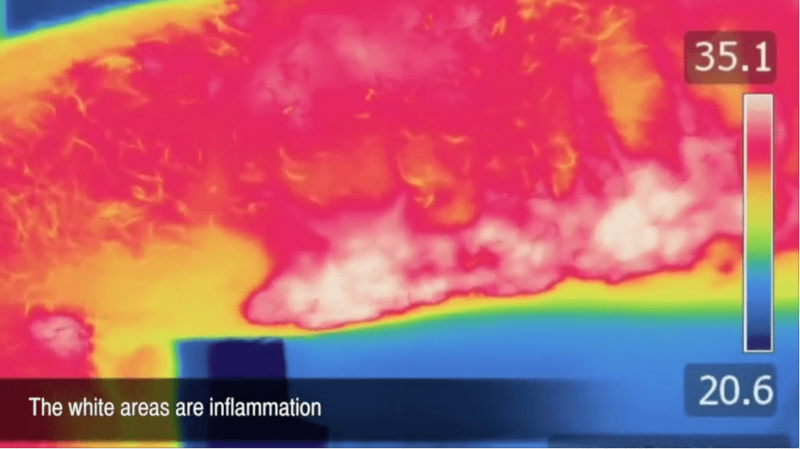 These white areas show inflammation 30 minutes after the single blow. Whip proponents argue that horses are much larger animals than us and have thicker skin and a higher pain tolerance. There is nothing to support this claim and McGreevy points out that horses can feel even a fly land on their skin such that it triggers a characteristic shake called the “panniculus reflex”. It is rather naïve to assume being beaten repeatedly with a blunt object is a pain free experience. When off the track, race horses in training are stabled for the majority of the day. This is the most practical way to “store” a horse, however, this isolation robs them of social and environmental stimulation. Stabled horses can developed neurotic behaviors such as crib-biting, wherein they bite on fences and other fixed objects, as well as swaying back and forth and self-mutilation. After all of this pain and suffering, you’d think that racehorses would be rewarded in the end, especially the champions. But these animals are treated as disposable commodities, regardless of their achievements. When a horse is no longer able to perform or his or her performance is no longer deemed adequate, he or she tossed aside like so much garbage. Those who break down on the track are euthanized on the spot and sent off to rendering plants for pet food and byproducts or simply dumped in a junkyard like racehorse “teller all gone,” whose body was left near an old toilet after breaking a front leg during a race. Those who don’t die or are killed on the track are sometimes downgraded to lower-level racing, like jump racing, which caries up to 20 times more fatalities than flat races and has far less regulations and standards. The final destination for most failed racing horses is slaughter, where captive bolts are often sloppily and ineffectively used, prolonging the painful and terrifying death of these long-abused animals. Even champions who won their owners hundreds of thousands of dollars are sold for a pittance. In the United States, these horses face the additional horror of several days travel to Canada with no food, water, or temperature regulation. Let me know what you think about this topic in the comments! Melbourne Cup: “Owners” love you when you win. When you die trying, it’s “unfortunate”. Exercise-Induced Pulmonary Haemorrhage in Thoroughbred Racehorses Effects on racing performance by K.W. Hinchcliff, J. McCaffrey, P. O’Callaghan, P. Morley, M. Jackson, J. Brown, A. Dredge, A. F. Clarke. In the video, I refer to “penniculus reflex” as “menniculus reflex”. The article has been corrected to reflect this correction. I always felt there was something inhumane about this sport. Obviously the influence of money in the form of gambling made this sport so huge. Now it’s dying in terms of popularity compared to what is once was. Hopefully one day it will be outlawed along with greyhound racing. I despise all animal “sports”. I already knew it was very bad, but now I know even more. As usual I did not want to watch this video, but I realize to a certain extent at least, the cost to you personally as well as all the work, the least I could do was watch it. Thank you for educating us Emily! well thank you so much Elaine- that means a lot to me- it is quite an endeavor making these. The TB industry breeds up to 3 million horses a year. Considering a horse can have a life span of up to 30 years, that’s a lot of horses who have no where to go after a “career” in racing. The deliberate OVERBREEDING is what needs to be addressed. There is far, far more money in breeding than what is available as payouts at the track. Mares are nothing more than incubators and studs can breed *hundreds* of mares in a season. Often studs are sent to the southern hemisphere during the “off” season in North America. In addition, horses off the track are often difficult to rehabilitate into a reliable, useable horses because of their negative experiences on the track…horses *never* forget. The problem needs to be addressed at where it begins: overbreeding. Unfortunately there are also tax breaks for breeders, so it is supported by government. these are great points, Terri. thank you for your insights. Thank you for making this video. I am horse therapist and equine enthusiast. Ever since I was little I never enjoyed horse racing. To prove my point to other equine enthusiasts who apparently love their horses so much, that horse racing is by far the cruelest sport in the equine industry was a big battle for me. Until I went to Dubai to stay with a former trainer of mine, she owned a race horse and provided us with free VIP tickets to go watch some racing. My mom and I just sat at the back most of the time until we saw one horse’s leg snap at the final turn. Then we were in front with tears running down our eyes but then everyone else went to the back and didn’t even bothered to look. It was disgusting. Also, during my studies we got to work with top race horses and the amount of pain these horses had over their bodies was just terrible. The bulk of muscles as well is just too unrealistic for such a young horse and some were so difficult to handle because of the amount of food and steroids they get. The race industry is just disturbed by money like most things on this earth. thank you so much for this comment and for sharing your insights Ash! it means so much more coming from someone in the equine field. so appreciate it. Well done, Emily! Let’s spread the word! I love how informative and well researched your videos are! It makes sharing them on other social media SO EASY because I don’t have to worry about ridiculous comments from the peanut gallery. It’s just fully of sound evidence! Great work Emily! Looking forward to watching more. PS. I just subscribed to your newsletter and can’t wait to read your E-Book! thank you so very much Allie! i’m so glad you enjoy the videos and very happy you appreciate the research that goes into them! :) many thanks and happy to have you as a newsletter peep! Thanks you for writing this. I was just at a job interview a few days ago a at eventing yard and was disgusted and had to leave and reject the job.